Jason Waldron, Harvard Athletics' facilities manager, tours Bright Hockey Center, where the lights were converted to super-efficient LEDs to save costs and energy. Sending his eyes across the Bright Hockey Center’s broad expanse, Jason Waldron marvels at how much better the place looks. Waldron, Harvard Athletics’ facilities manager, knows that the super-efficient bulbs he installed earlier this year will dramatically reduce maintenance and energy costs. But he also is happy to report that the brighter, more consistent lighting is already getting rave reviews from players and coaches. In response to the growing climate crisis, businesses and institutions in recent years have been focused on constructing and renovating their buildings to meet ambitious green building standards, including Leadership in Energy and Environmental Design (LEED) certification. With more LEED-certified building projects than any other higher education institution, Harvard is no stranger to this approach. But a complementary trend is emerging in which building managers and facility leaders, including Waldron, are increasingly working behind the scenes to optimize building energy systems and performance. The projects, which range from installing energy-efficient equipment to ongoing efforts referred to as commissioning and retro-commissioning, are focused on ensuring that buildings are operating as efficiently as possible. While these projects are delivering real energy and greenhouse gas reductions — which contribute to Harvard’s goal of reducing greenhouse gas emissions 30 percent by 2016 — the Schools and departments undergoing these changes are also realizing enormous savings for the University, to the tune of millions of dollars. The changes being made are not just saving money, they ultimately result in systems that work better as well, officials say. At the Faculty of Arts and Sciences (FAS) Laboratory for Integrated Science and Engineering (LISE), an ongoing retro-commissioning project has led to $3.15 million in savings since 2009. The facilities team monitors more than 3,400 data points from equipment such as air handling units, and chilled- and hot-water pumps. Reductions in airflow have had the greatest impact. Additional actions like identifying energy-wasting leaks have also contributed. A commissioning project frequently starts with an audit that identifies inefficiencies and opportunities to improve building systems. Teams then update training documentation and create tracking reports including automated alarm flags and reports to monitor problem areas. This strategy makes data analysis much easier in buildings that operate 24 hours a day, including laboratories and dorms. At Harvard Business School (HBS), a commissioning project under way since 2008 has covered 14 buildings, yielding more than $320,000 in savings. The changes have contributed to a 3.6 percent reduction in greenhouse gas emissions. The simple payback (when the costs are made up for by the savings) for the projects implemented is 1.5 years. A new generation of energy conservation measures is being ushered in, thanks to recent changes made to the University’s Green Revolving Fund. The fund, which provides no-interest loans to Schools and departments for campus projects, was revamped by a University-wide committee of facility and financial managers. According to the Office for Sustainability, since the changes were made in December 2012, more than a dozen projects have been funded that will reduce greenhouse gas emissions and deliver more than $664,000 in savings each year. Harvard Medical School plans to use the loan fund in the upcoming year to fast-track efficiency improvements in the Tosteson Medical Education Center, along with commissioning and optimizing heating and cooling systems and lighting controls across that campus. Harvard Athletics took out loans to upgrade the lighting in four buildings — including the Bright Hockey Center, the Lavietes Pavilion, and the Gordon Indoor Track — to LED (or light-emitting diode) bulbs. As commissioning spreads across the University, there are likely to be more significant savings. A recent review conducted by Harvard Green Building Services of 83 of the University’s largest and most energy intensive buildings found that retro-commissioning or ongoing continuous commissioning projects could deliver a predicted average reduction in greenhouse gas emissions of 7,238 metric tons of carbon dioxide, with an average annual utility savings of $4 million and a simple payback of around two years. 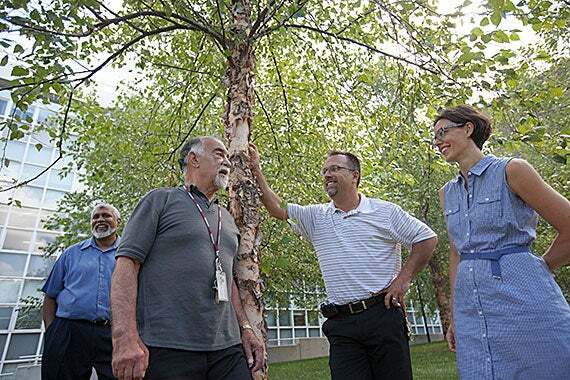 Maintenance manager Mitra Nathasingh (from left), senior facilities manager Thomas Tribble, manager of small projects and alterations Mark Pimentel, and administrative coordinator Jesselynn Opie are in front of the FAS Laboratory for Integrated Science and Engineering, which is one of the campus’ ongoing retro-commissioning projects.